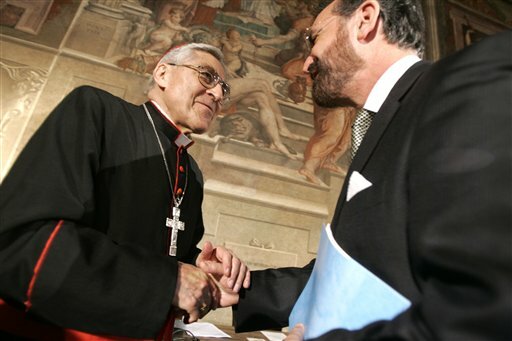 French Cardinal Jean-Marie Lustiger, left, greets Rabbi David Rosen, president of the International Jewish Committee for Interreligious Consultations, during a a commemoration of the "Nostra Aetate" document of the Second Vatican Council, in Rome Thursday, Oct. 27, 2005. Rome's chief rabbi, Riccardo di Segni, said he had refused to attend the ceremony because of the presence of Cardinal Lustiger, one of the keynote speakers, a Jewish convert to Catholicism. In the "Nostra Aetate", the Catholic Church deplored anti-Semitism and repudiated the "deicide" charge that blamed Jews as a people for Christ's death. Thursday marked the 50th anniversary of the issuance of the most radical document by the Second Vatican Council. It&apos;s called Nostra Aetate, or "In Our Times," and it opened up relations between Catholicism and non-Christian religions.The landmark document repudiated anti-Semitism and the charge that Jews were collectively guilty for the crucifixion of Jesus Christ. The history of relations between Jews and Christians started in what is today one of Rome&apos;s trendiest neighborhoods, where chic cafés line a pedestrian area and where people can stroll and admire an ancient Roman portico. Restaurant waiters assure tourists that their fried artichokes are the best in town. 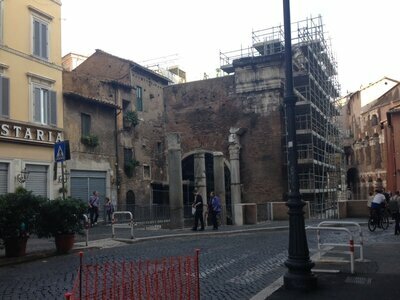 This was once Rome&apos;s most shameful neighborhood — a flood-prone area of four cramped blocks where, for more than three centuries, the city&apos;s ruling popes confined the Jews. It&apos;s still called the Ghetto. "You breathe history here, your hands touch it, and you walk on layer after layer of history under these cobblestones", says Georges de Canino, painter and Ghetto resident. Memories of past suffering are still vivid as he points to a church at the end of the street, Sant&apos;Angelo in Pescheria. "That&apos;s where on Saturdays, friars preached sermons Jews were forced to hear. If you plugged your ears with wax," says de Canino, "they beat you. On the San Gregorio Ai Quattro Capi church, de Canino points out an inscription in Latin and Hebrew about "stubborn Jews." And pointing toward Santa Maria del Pianto, he says the Ghetto was encircled by churches, "a sign of Catholics&apos; obsession with trying to get us to convert." 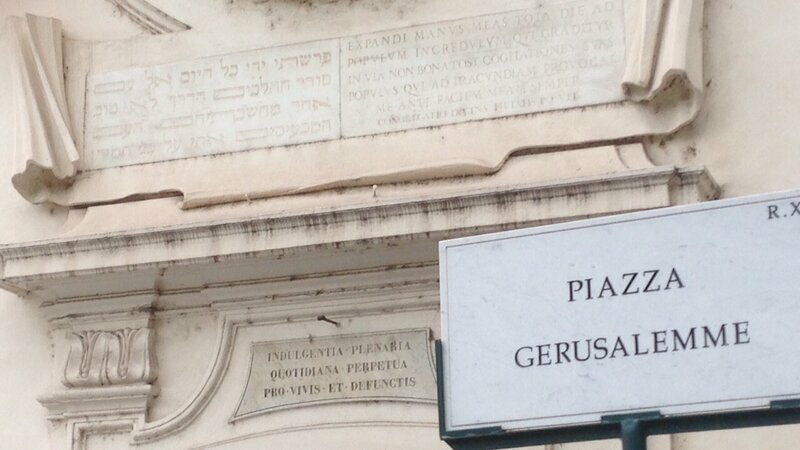 The Jewish community in Rome is the oldest outside Israel — Jews settled here before Christianity. Their history is illustrated in the Jewish Museum of Rome along the Tiber River. Tour guide Ursula Dattilo says Jews lived relatively well in antiquity. "[The] trouble starts in 1215, when a pope decided Jews have to be recognized by their way of dressing," she says. "It&apos;s a special hat for the men with a cone in the middle, and a scarf with blue stripes for the women." With the Counter-Reformation, the Church cracked down even more. In 1555, Pope Paul IV locked Roman Jews in the Ghetto. It wasn&apos;t demolished until 1870, when Rome was liberated from papal power. But it was another 100 years before the Church reassessed its relations with Jews. During World War II, Angelo Roncalli was The Vatican&apos;s ambassador to Turkey. There, he helped many Jews escape the Nazis by issuing false baptismal papers. When he became Pope John XXIII and convened the Second Vatican Council to bring the church into the modern world, he wanted an end to what had been called centuries of "contemptous" church teaching about the Jews. There was much obstruction — some bishops even handed out anti-Jewish leaflets in St. Peter&apos;s Square. But in 1965, Nostra Aetate was finally issued. Rabbi David Rosen, inter-religious affairs director for the American Jewish Committee, says it was truly a revolutionary document. "That took us from a situation where the Jewish people were seen as cursed and rejected by God, and even in league with the devil, to a situation now where popes say it is impossible to be a true Christian and be an anti-Semite, and that the covenant between God and the Jewish people is an eternal covenant, never broken." In Nostra Aetate, the Catholic Church acknowledged for the first time that Jesus is the link between Christianity and Judaism, says Church historian Massimo Faggioli. "In this document, the Catholic Church accepted the idea that Christians don&apos;t own Jesus," Faggioli says. "That is theologically revolutionary, because in the Catholic mindset, Jesus was a Catholic." Father Thomas Reese, senior analyst for The National Catholic Reporter, says Nostra Aetate recognized there are positive elements in other religions, and that through inter-religious dialogue, stereotypes and prejudices can be overcome. "For us, religious freedom is a matter of church teaching," he says. "We have to observe it, we have to respect it; whereas before Vatican Two, we were not very respectful of religious freedom." At first, inter-religious dialogue was not easy, remembers Lisa Palmieri-Billig, the American Jewish Committee&apos;s representative in Italy and liaison to the Holy See. "There was so much diffidence on both sides," Palmieri-Billig says. "On one side, the Christians said, &apos;How come you Jews don&apos;t recognize Jesus with all the miracles that he made?&apos; And the Jews say, &apos;All you want to do is convert us.&apos; And you couldn&apos;t get people really to participate. But gradually it opened up." While there&apos;ve been some misunderstandings, great strides have been made in Jewish-Catholic ties. Celebrating the 50th anniversary, Pope Francis said, "From indifference and opposition, we&apos;ve turned to cooperation and goodwill. From enemies and strangers, we&apos;ve become friends and brothers."